Home › What is EMDR? Hand in hand with Hypnotherapy, I use EMDR (Eye Movement Desensitization & Reprocessing), which is one of only four empirically supported therapies for treating Traumatic Stress. It’s used by the US Army to treat Trauma in combat soldiers & is broadly used treating PTSD & other Traumatic Stress Disorders across the globe. Trauma is a word that describes a lot of things. Really it’s a way the brain stores infromation to help us look out for danger. If your card slides on ice and scares you, your mind can store that fear to make you fearful about driving on ice. This then makes you take more care when the fear is triggered by seeing ice for example. However, when the reaction is too big and holds you back rather than making you notice the risk, that’s where trauma becomes a problem. Trauma doesn’t have to come from big things, it just has to have a big reaction. Fear of death or injury, huge shock, or other sudden overwhelming emotion can cause the mind to store information as a trauma, and then to push your behaviour when triggered. When it’s out of control too many things bring up the bad feeling. For example, if you’d been mugged by a bridge, by two guys, one of which had a knife, then there are many things that could act as reminders. Knives, bridges, 2 men, even seeing someone dressed similar could spark off a bad feeling, often without you consciously noticing why. Typically this sort of reaction makes you nervous and jumpy in general. It often pushes you to isolate yourself as you’re not getting on with family and friends as much. Nightmares and flashbacks could occur. Usually a feeling of dread or anxiety will be present a lot, drive and motivation tend to decline. For some people comfort eating, drinking, drugs and similar ways to distract from the bad feeling can rise up and make things worse. 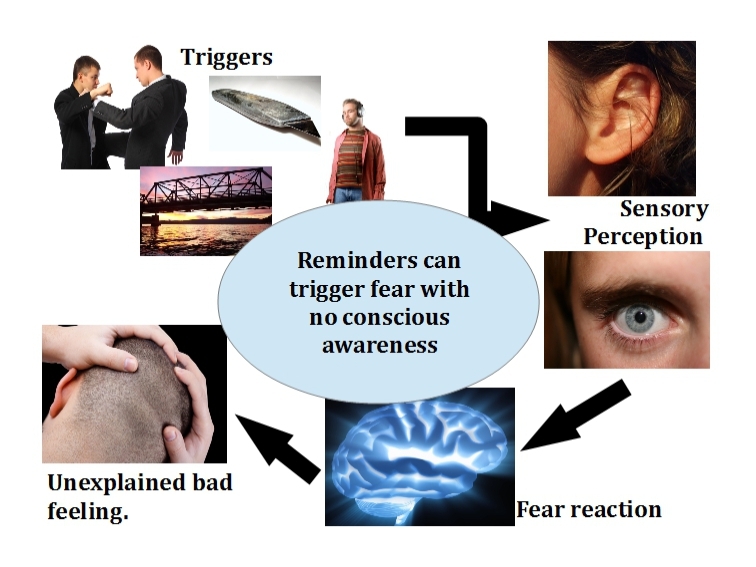 EMDR (Eye Movement Desensitation and Reprocessing) is an evidence based, natural, drug free therapy that triggers a natural healing ability of the mind to reduce the emotion stored as part of the trauma, thus reducing the triggers and bad feeling so it no longer causes problems. It’s used a lot by Emergency Services, Military, and psychologists across the world and is one of only 4 proven methods to reduce PTSD (Posttraumatic Stress Disorder). I’m trained by the EMDR Institute, which is the same organisation that trains US Army therpists to deal with trauma. I’m trained in Level 1 (Standard) and Level 2 (Advanced) in EMDR and am specifically trained to work with special populations including Military personel. Trauma can come from anything that hurts, bullying, car crashes, near death incidents, grief, and more. If something from your past is often on your mind and hurts to think on it may be stored as a trauma, and may be pushing your life in ways you don’t understand. The good news? Trauma can change! Thankfully we understand how it works much better than ever before and have evidence based therapies with high success rates to use now. * EMDR was placed in the “A” category as “strongly recommended” for the treatment of trauma. EMDR is an in-clinic method requiring very little effort on the part of the client outside the clinic visits. If you’re unsure as to how I can help you, I’d be delighted to discuss your needs at a free no-obligation introductory session where we can get to grips with your needs and where you can get a taste for how hypnosis will work for you. In all cases a free assessment is available to determine the best way forward for you. All therapy is offered with a high degree of professionalism and expertise in a safe, confidential and non-judgemental setting.